Parameter--IRrejection: 85%; UV rejection: 97%; VLT: 10%；thicknessof 0.15mm. Mirror effect--The mirror effect we saidmeans it has a slightly reflective effect, not totally like a mirror. 1.One way window film with mirror window filmon one side and a window tint film on the other side.Window heat control filmcan reduce UV damage, as well as be used to protect the privacy during daytime. 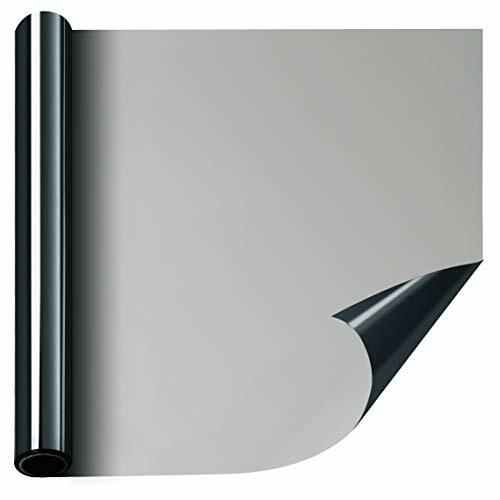 3.It is a self adhesive static window filmwith no glue. 4.One-way daytime privacy depends on thelight intensity. In general, people inside can see through the glass windowtint, while people outside can't see people inside during daytime due to thestrong sunlight outside; when indoor light is stronger than outdoor atnighttime, people outside can see people inside. Remember to draw curtain duringnight. 5.Peel off the backing transparent protectivefilm, paste the film to the window and use your hand to press it from the topdown so that it can tightly attach to the surface, put protective film onwindow film before squeegee away water and air bubbles,prevent damaging windowfilm. 6. Black/Silver: you will see the silver outside the room, and black indoor. NOTICE:THE SIDE PEELED OFF FROM THE FILM SHOULD BE ATTACHED TO THE GLASS. HEAT INSULATION AND ENERGY SAVING - Window film Blocking out 85% of infrared rays, 10% of VLT meaning effectively reduce glare, the heat control window film can retain heat in winter and keep it out in summer, helping reduce expensive heating and cooling costs. NOT RECOMMENDED for DUAL PANE WINDOWS. STATIC CLING AND NON ADHESIVES: Glue free design, no chemical release, very easy to install, just make sure window surface is completely clean and absolutely free of any blemishes, remember to use A LOT of soap/water mixture to soak both the adhesive side and window，This removable solar window film is made from earth friendly PVC, thickness of 0.15mm, clear and bright, no need glue when applying. AFTER-SALES SERVICE-30 days return policy guarantee against any product defects guarantee. Any question, feel free to contact us,You will have a perfect shopping experience. If you have any questions about this product by FILMGOO, contact us by completing and submitting the form below. If you are looking for a specif part number, please include it with your message. Flamingo P Moroccan Navy Valance Curtain Extra Wide and Short Window Treatment for for Kitchen Living Dining Room Bathroom Kids Girl Baby Nursery Bedroom 52" X18"